Ryan brings his 12 years of news experience to voiceover. You’ll hear the quality as soon as you open the audio file with your vocal track. Dedication is the best word to describe Ryan. You’ll have his undivided attention when you hire him for your project. In a jam and need voiceover talent fast? Ryan can get what you need within two hours. You’ll get a quality voiceover artist in record time. Ryan wants to make sure that you’re satisfied with the voiceover. He takes direction well, and he’ll stay in communication with you in all stages of the project. 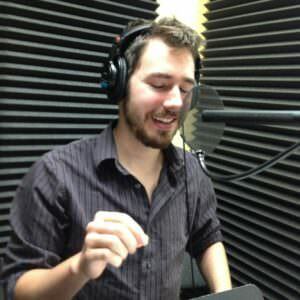 Your voiceover should have the best sound, and Ryan agrees. He not only takes pride in delivering the crispest and cleanest voiceover behind the microphone, but he also makes sure that he takes time to edit as well to deliver the perfect voice for your project. Send Ryan a message, and he’ll take care of your project, giving you more time to focus on what’s important to you. Have a project to discuss? Tell me about it.